Here is definitely a place where you should consider going to if youre looking to break your fast around Bangsar (specifically Bangsar South area). VE Hotel & Residence presents a flavourful heritage journey this Ramadan offering their buka puasa dinner themed "Ramadan Bersama Citarasa Bonda" at The Straits Estate. And yes, if you miss the taste of Malacca, VE Hotel & Residence will be serving you melting pots of culture with an impressive selection of traditional and local favorites in a myriad of rich flavors. I can guarantee that their talented chefs have put a lot of effort and attention to create such an array of delicacies namely Asam Pedas, Kari Ayam Kapitan, Portuguese Lamb, Siakap Teowchew, Daging Kerutuk, Gulai Umbut Pisang, Chicken Pongteh, Madras Lamb Masala, Beef Tauchu, Lamb Roghanjosh and Chicken and Apricot Tajine. Most of the dishes really remind me of the traditional flavors of when im in Malacca, and even some that I've never gotten to try before. For appetizers, you'll be spoiled with options! You'll be able to enjoy freshly made Onde-onde, Pie Tee, Keria Gula Melaka, Cakoi, Otak-otak Daun Nipah, Popiah, and more! To be honest, i wish i had more space in my tummy to enjoy all these appetizers as I've only tried their onde-onde, and pie tee before digging into the main dishes. Trust me, when you witness the main dishes before your eyes, you'd find it hard to resist to dig in! And as for desserts inspired by The Straits Heritage, the buffet spread offers an array of luscious dessert featuring Sago Gul Malaka, Bubur Kacang Hijau with Durian, Bubur Gandum Jagung, Ice kacang with condiments, Dodol, Kurma, assorted local seasonal fruits, assorted Malay Kuih, and Traditional Cookies. I was also impressed that they even had freshly cut fruits that you can DIY a bowl of buah rojak for yourself. Yums! 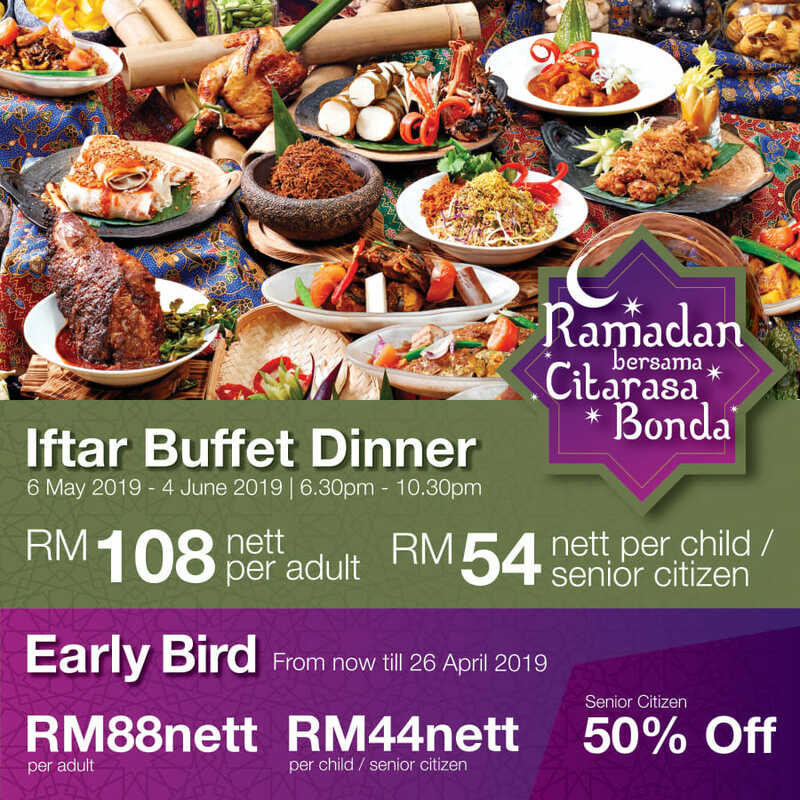 The buffet is available from 6th May 2019 till 4th June 2019 from 6.30pm till 10.30pm and its priced at RM108nett per person. Enjoy more family gathering and happy moments with your loved ones as VE Hotel & Residence offers 50% off the normal rates for senior citizens and also for children. For those who would like to grab the early bird vouchers, they are available from now till 26th April 2019. For advance booking, you'll enjoy the offer at RM88nett per adult and 44nett per child. On top of this, since the festive season is about the season of giving, VE Hotel & Residence is raising a charity by giving away free Bubur Lambuk with a minimum donation of RM3 to help children that are in need. So diners, if you'd like to be a part of their campaign, be sure to speak up as a small amount from your wallet can really go a long way. I have trust that their management will make good use of the donated amount given to selected charity centers.